The parish of Chalgrove comprises some 1115 hectares. In addition to Chalgrove itself, which embraces a small part of Cutt Mill, the parish includes the former Liberty of Rofford, and the former parish of Warpsgrove, which was absorbed in 1932. The struck flints and the extensive flint scatter are indicative of human habitation in Mesolithic times, and examples of continuous occupation since then include Neolithic axes, early Bronze Age ditches, Bronze Age, Iron Age, and Roman settlements, a cremation in an urn, and many coins including a Trinovarian gold stater, and two hoards of Roman coins, one of which included the internationally important Domitianus coin. It is clear from the entries in the Domesday Book - five mills and twenty ploughs in total, with land for 19 ploughs in total - that by 1086 the parish was a well-established and productive corn-growing area, undoubtedly farmed by the open field system that had been established by the Saxons. The manor of Chalgrove, with its various appurtenants had been granted to a series of members of the royal household, from time to time reverting to the king, a portion always being retained by the Constables of Wallingford Castle. In 1233 it was divided into two equal parts and, until 1485, one of these was held by the Barentin family who played an important role in international, national, county, and local affairs; their principal residence was undoubtedly the medieval moated manor house discovered in Hardings Field. The other manor was held by John de Plessis who, through marriage, became Earl of Warwick. There is much evidence that he was responsible for a large scale building project in Chalgrove in the 1230s, which was probably the creation of the 'court within a moat' surveyed in 1336 that preceded the mid C15 manor house which stands today in Mill Lane. This manor became divided in 1354. By the end of the C15 century a large proportion of the lands comprising the two manors had passed into the ownership of Magdalen College, Oxford, which for more than four-hundred-and-fifty years retained an enormous landholding in Chalgrove, lasting until 1942. The sixth of the manor that had been acquired by Lincoln College was, in time, transferred to Magdalen College, and the other sixth descended through the Pudsey/Blount line until it was purchased by Magdalen College in 1900. But, in spite of these separate lines of descent, for more than seven hundred years the manors were administered mainly as a unitary estate. In 1643, during the Civil War, Chalgrove and Warpsgrove became the scene of a battle. At around 4.00 pm on Saturday 17 June, Prince Rupert, the King's nephew, left Oxford with a raiding party of 1500 to 2000 men and attacked the Parliamentary camps at Postcombe and Chinnor. Early on Sunday 18 June, as the Royalists were returning to Oxford, Colonel John Hampden, who happened to be in the locality, joined a small force under the command of John Gunter. They began to harry the rear of Prince Rupert's column, hoping to delay Rupert's crossing of the River Thame at Chiselhampton until reinforcements arrived from Thame. The forces, mostly cavalries, clashed at the edge of the open fields to the north of Chalgrove. The Parliamentarians were driven from the field and John Hampden, a leading Parliamentary figure, nationally popular and respected, received the wounds from which he died six days later in Thame. Two hundred years after the battle a monument was raised in Hampden's memory, although this too caused a deal of controversy. It stands off the B480, where the road to Warpsgrove crossed the former Oxford - Watlington road, opposite the entrance to Chalgrove airfield. This also boasts a memorial, erected to commemorate the hundreds of United States Army Air Force personnel who served on the base, constructed in 1943 during the Second World War, exactly 300 years after the previous conflict. The unarmed photo reconnaissance aircraft flew over German-occupied Europe, recording the vital information used for the Allied landings in 1944. Since 1946 the Martin-Baker Aircraft Company has used part of the airfield for developing life-saving ejector seats. For some years the huts provided temporary accommodation for post-war squatters, after which some provided housing for poultry. The area was gradually extended as an industrial estate, eventually becoming a business park. The other part of the airfield was returned to agriculture, and a new road was constructed, as a replacement for the former Oxford - Watlington road, on the line of southern perimeter track of the airfield, thus creating an obvious pocket for expansion of the village. Many of the changes that had occurred in other areas came much later to Chalgrove. The Saxon/medieval open field farming system, whereby villagers held individual strips of land in vast open fields, and shared the common land to the north, remained in force until 1845. 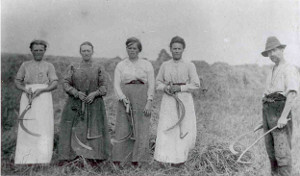 New farm machinery such as the reaper and binder and steam-powered equipment were introduced in the late 1800s but primitive methods of cutting corn with hand tools were still seen in Chalgrove a decade and a half into the 20th century. Until the early C20, virtually all of the inhabitants of the parish were dependent on agriculture for their living and like most rural communities the parish was more-or-less self-sufficient. 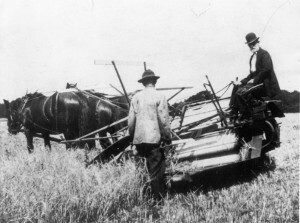 Because of their dependence on farming the people suffered greatly during times of agricultural depression. In a study of 1892 Chalgrove parishioners were described as being 'poor and discontented' and their conditions in terms of housing, pay, amenities and relations with their employers were considered to be worse than in most of the surrounding villages. Around the turn of the C20 many men moved away from the land and found employment in industry near home and further afield. The Great War took its toll of the working men of the area. 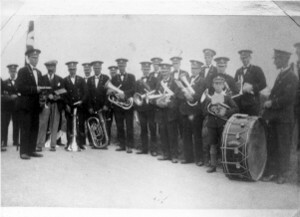 Later the motor works at Cowley provided additional employment which attracted others to the village from as far afield as South Wales and the north of England, necessitating the building of extra dwellings in Chalgrove by the local council. By the 1950s a large proportion of the local populace worked at the Cowley car factories. Others had found employment at the Martin Baker Aircraft Company and the Monument Industrial Park or Tower Estate, which had taken over many of the deserted encampments. The growth of the village can be seen most clearly in the census returns, taken every ten years since 1801. They show that the population of Chalgrove never exceeded 700 until after the Second World War. In the early 1930s it was little more than half that but it reached a remarkably high figure of around 800 in 1951, due to the large number of squatters and displaced persons who had moved into the Nissen Huts of the former American Air Base. The huts with their families were eventually officially 'adopted' by the Bullingdon Rural District Council and facilities were provided, including a school. The number dropped to 652 in 1961 when many of the families had been re-housed at Berinsfield or Littlemore, although most of the original Chalgrove inhabitants who were temporary tenants had had new houses built for them at Brookside. In the early 1960s a rapid expansion took place, mainly due to the fact that the village was outside the Oxford Green Belt and by 1971 there were 2,433 persons recorded. The present population is approximately 3,000. Chalgrove Friendly Society was established, on 6 July1840, to provide funds for those unable to work due to sickness or injury. The balance of the funds was spent on a roast dinner for all of the members on the Wednesday following Whit Sunday. Perhaps this celebration took the place of the Wissenail, last recorded in 1805/6, or Claypit Sunday, another merry-making event, held in mid Lent. The Friendly Society disbanded on 23 June 1913 after the National Insurance Act was introduced. 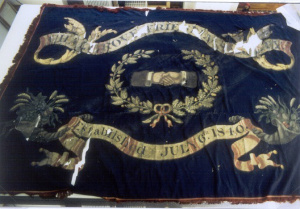 The splendid banner, suitably restored with the help of funds raised by the History Group, can be seen in the church. Chalgrove Feast, an event which celebrated the Feast of the Assumption of the Blessed Virgin Mary, to whom Chalgrove Church is dedicated, probably originated, in medieval times. It took place in August and was always marked by the arrival of a fair which in the early part of the 20th century stretched along the High Street, around the Green and across to the present-day Recreation Ground. Although the Feast is no longer celebrated a fair still visits the village in early September. 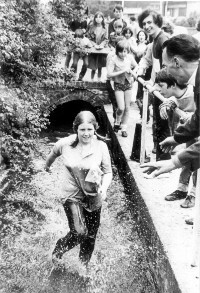 The annual horticultural show, first held in 1966, provides another diversion in early September, but the annual Brook Race, first held in 1971, had to be abandoned after only five years for reasons of health and safety. That slot was soon filled by 'Donkey Derbys' and then, from 1978, by the annual May Festival, now with an annual 10K Road Race, rather than the one-time Pram Races and Duck Races. St Nick's Fair has been held on the first Saturday in December for more than twenty years, and various other fund-raising occasions are becoming annual or biennial events, organized by the many clubs and societies in the parish, some long-established and some more recently formed, more than thirty in all. 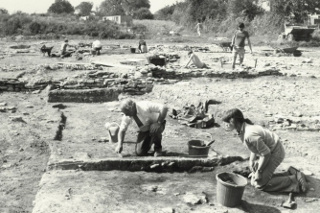 From flint stones to flare paths, from wall paintings to websites, the Parish of Chalgrove has evolved and ever continues to embrace the march of progress.